Families from Perimeter Church volunteered on the church's Serve Day on December 1st, proving that Fully Furnished Ministries is truly a family ministry. The volunteers helped prepare and load the furniture that was delivered to 12 vulnerable families in need. 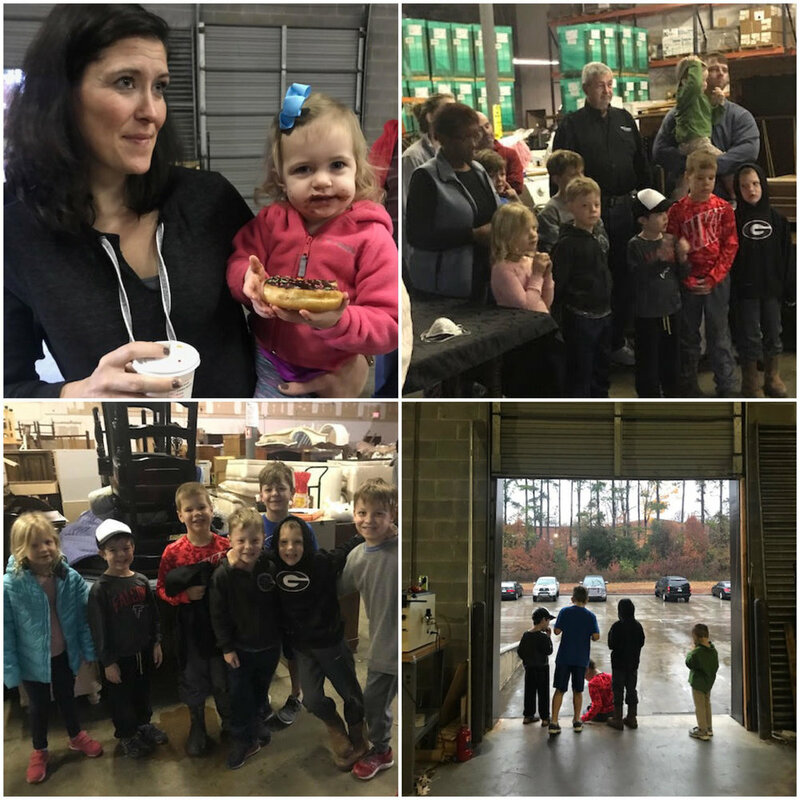 Momma’s holding babies, toddlers pushing carts, dads and moms doing the heavy lifting and donuts keeping everyone happy — it was a great morning at the warehouse! The recipients greatly appreciated the furniture and furnishings, and the volunteers greatly appreciated the opportunity to serve. Families serving families is a unique opportunity we are thrilled to offer as a ministry. If you are a parent of small children having a hard time finding somewhere to serve, or parents wanting to get children involved in giving back to the community (from an early age! ), then FFM is a great spot for your family to volunteer. This youngster showed that with the right equipment anybody can load a truck! This bedding put the finishing touch on one of our deliveries of essential furniture, helping to turn basic shelter into a home. Many of us take lying in our beds every night for granted, not knowing what it feels like to not have a bed. This precious little girl was so excited to have a bed to lay in tonight. She was sleeping on a mattress on the floor before Fully Furnished Ministries volunteers visited her home and blessed her with a bed of her own. After the delivery of the furniture for the family, the grandfather of the girl and I had a conversation about all that is going on in Venezuela and how they are having to flee the country. Seven of his kids are in different states across America. Though they are thankful to be here in the US, it is a tough road for them. We spoke as if we had known each other for quite some time as he opened up and shared his heart. This ministry is truly a blessing for me and so many. Join with us in praying for this family and other refugee families who are far from home, building new lives in new places and without much to make their place feel like a real home. They were sleeping on the floor—after we furnished their apartment they couldn’t wait to pay it forward!